Greenpoint, land of rapidly rising rents and Girls sightseeing tours, is in the midst of a cool-kid renaissance. 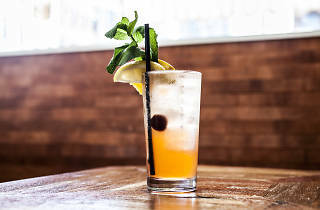 Tucked into Brooklyn’s northern tip and accessible only by the erratic G train, the once-scrappy underdog to dominating Williamsburg is now a dining destination in its own right, attracting not only Lena Dunham fan-girls but also cachet-boosting restaurateurs like the Brooklyn Star’s Nick Padilla and Waine Longwell. 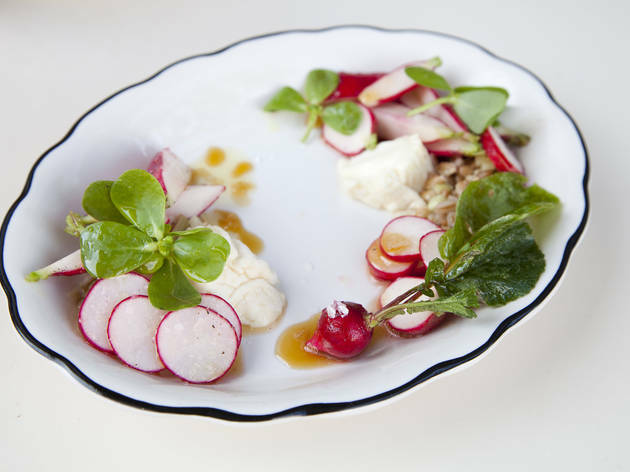 The duo’s smart, striking bistro, Alameda, resets the standard for the neighborhood, once home to only beer-pouring local joints and Polish dance halls. 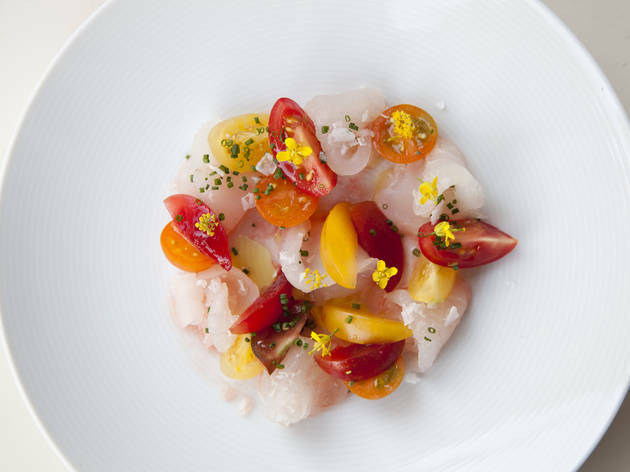 DRINK THIS: Padilla’s New American menu has some notable items—like melt-in-your-mouth raw fluke marinated in zippy apple vinegar and chive oil ($9)—but Longwell’s beverage program is the real draw. 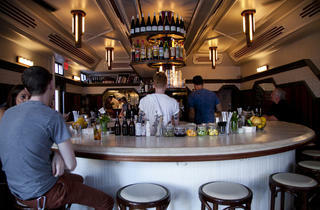 The handsome, horseshoe-shaped bar commands the room, and from it come quaffs that cheekily riff on classics. The gin-and-Lillet Phil Collins ($11) is rounded out with bittersweet aperol, bubbly prosecco and lemon juice for a take on the Tom Collins, while the rum-based Daq to the Future ($10) infuses Velvet Falernum (a Barbadian sugarcane liqueur) with chilies from nearby Eagle Street Rooftop Farm, mixed with grapefruit and lime juices for a spicy-cool sip. GOOD FOR: An upmarket stand-in for your everyday hang. 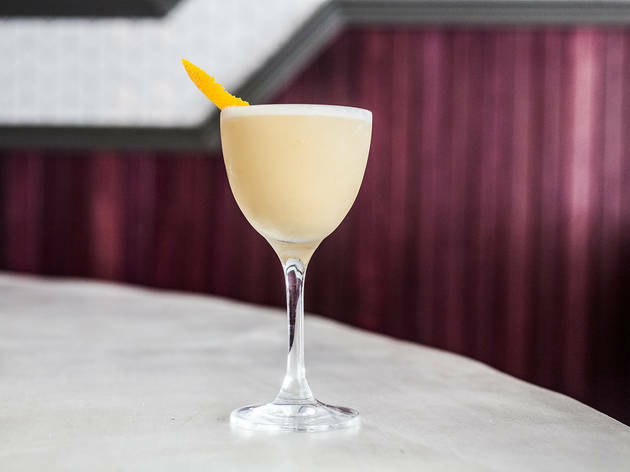 Alameda is the Jennifer Lawrence of bars—stunning yet instantly approachable, with a serious eye on the craft (namely, cocktails) but a daffy sense of humor (namely, those drink names). 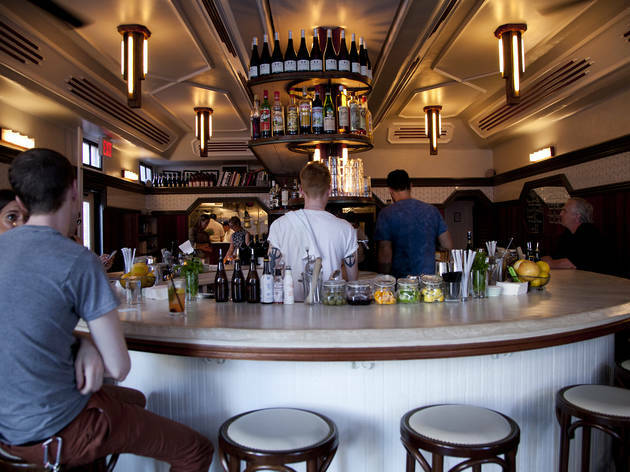 It’s a place where a tatted, T-shirt-sporting crowd can get a Guinness as readily as a biodynamic wine, where happy-hour specials include beer-and-shot combos and oysters with cucumber mignonette. THE CLINCHER: Evan and Oliver Haslegrave—the bearded brothers behind hOmE design firm—co-own the bar and applied their sleek touch for the 60-seat interior: purple heartwood wainscoting, leather banquettes and glossy tiled walls. 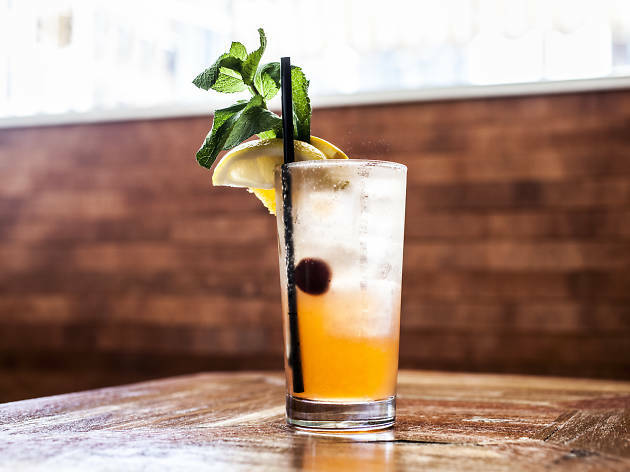 Their white-and-wood aesthetic is becoming something of a signature in north Brooklyn, reflected in dapper haunts including beer mecca Tørst, breezy drinkery Donna and the forthcoming Ramona, a sister to East Village lounge Elsa. One thing’s for sure—unlike Hannah Horvath and her ill-fitting rompers, Alameda is the style icon that newly chic Greenpoint deserves. My girlfriend and I went to Alameda for dinner a few nights ago and it was a very pleasant surprise. We sat at the bar, and the bartender was very friendly. The chef greeted us at the bar and even brought out some free boquereons (its like bruschetta toast topped with anchovies) and they were fantastic. I'm not a huge fan of anchovies but these were from Spain and not hairy at all (I apologize for the weird commentary). My girlfriend ordered a burger which was delicious and very reasonably priced. I ordered a little neck clam dish which was served over a bed of pasta with some type of cream sauce which was fantastic. Good food, friendly atmosphere, a very nice night out.